Here's an interesting item from across the pond that might well be of interest to readers and publishers involved in comic workshops and comic art lessons here in the UK, or whose range might appeal directly to English teachers (such as Classical Comics or SelfMadeHero, perhaps). Comic book and graphic novel publisher Bluewater Productions is offering free lesson plans for its non-fiction comic titles, from its Female Force, Political Power, Fame, and Orbit series, to US educators and librarians. Developed in partnership with Chris Wilson, an educator and creator of The Graphic Classroom, web site Cynopsis reports Bluewater's new middle and high school aimed educational lesson plans feature a multi-discipline study of several of its biographical graphic novels and comic books including language, historical perspective, conceptual thinking, and decision making, as well as talking points, exercises and activity prompts. The program also hopes to encourage kids to read. Available via Bluewater (www.bluewaterprod.com) beginning this month, the first lesson plans will be are based on titles about historical figures including Hilary Clinton, Sarah Palin and Michelle Obama, as well as authors such as S.E. Hinton, JK Rowling, and Stephenie Meyer, not to mention pop stars Justin Bieber and Taylor Swift. Lesson plans for additional titles are set to follow over the next several months. Copies of the individual issues and graphic novels are also being made available at a discounted cost for classroom use. This week's edition of the radio show Panel Borders starts a month of shows about comic book shops with have three interviews recorded at Oxford’s small press comics convention ‘Caption’. 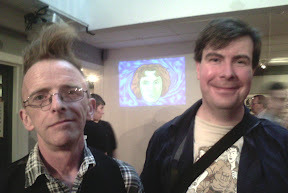 Alex Fitch talks to Doctor Who comic illustrator Al Davison, who runs a graphic novels and art supply shop in Coventry and to former Gay Comics writer Will Morgan, one of the proprietors of a comic book shop in Putney which specialises in classic British titles. Also, 2000AD artist P.J. Holden is interviewed by comics journalist Matt Badham, about the shops he frequented while growing up in Belfast. Also online now is Panel Borders: The art of P.J. Holden, an extra online exclusive episode of Panel Borders. 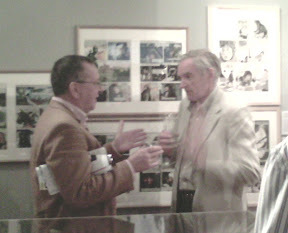 In an interview recorded at Oxford’s Caption comic book festival in 2010, comics journalist Matt Badham talks to 2000AD artist P.J. Holden about his work, from his formative years combining art and computers to getting his first Judge Dredd assignment and his most recent projects. 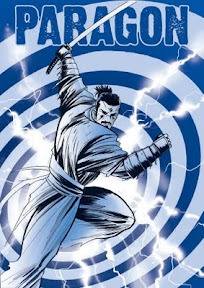 Issue 8 of the indie comic anthology Paragon is just out featuring a complete 15 page adventure starring the time-travelling demon-hunting Japanese warrior Jikan, ending the current story arc written by The Legendary Shark and drawn by Davey Candlish. Also in the issue is the second episode of Icarus Dangerous by Dirk Van Dom and Stephen Prestwood - Icarus didn't plunge to his doom but was rescued and now finds himself trapped on an alien spaceship... and just who is Meriope? James Corcoran takes over on art for G127 this issue as the action hots up in Rise of the Mekkosapiens, written by Locust of Death. Finally, there's the long awaited finale to Undertow - the Vatican hitman is determined to kill the goblin Messiah - but the underworld aren't finished yet... This is the last chapter of a weird and wonderful tale by the regular team of The Emperor and Davey Candlish. All wrapped up in a time warping Jikan cover by Chris Askham, it's the biggest issue yet at 36 pages! 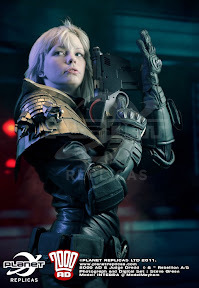 Planet Replicas launch Dredd costumes - ideal for vigilantes? Prepare to dispense justice like Judge Dredd and Judge Anderson - officially licensed Judge replica costumes from Planet Replicas are coming. (We can just see these being snapped up by those 'real life superheroes' the media loves reporting on at the moment). Faithfully reproduced from 2000 AD’s most famous lawman of the future, the costumes complete with the distinctive helmet, name badge, pads (shoulder, knee and elbow) utility belt, Lawgiver (sadly, not operational) and gloves. All other items can also be sourced through Planet Replicas. Personal customisation will be available, as well as other options. 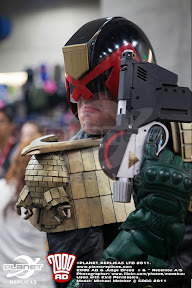 With the choice of male and female Judge costumes, outfits for the whole family are a possibility – ideal if you are setting up your own Mega-City One Sector House. British and Irish comics fan Steve Green is to finally launch his long-planned online zine Scratch, early next year - and is on the look out for contributors. First mooted in 2008 but delayed by 'real life', Steve says the inaugural issue of Scratch should go live in early January, and hold to a quarterly schedule from then onwards. "I'm after interviews, profiles, convention listings and reports, reviews, news -- anything, in fact, to promote British and Irish comics creators," he asks. One tradition I'm also contemplating resurrecting from my days running Critical Wave is art portfolios, offering a showcase to new comics artists, but I'll phase that feature in once Scratch has built up an audience. "For now, I'm on the look-out for contributors. If you're interested, please drop me a line via stevegreenATlivejournal.com, indicating your particular interests." The latest salvo of DC Thomson's Commando title are on sale in all good newsagents and on iPad -- and there's also some good news for fans of the glorious cover art that graces many of these comics this month. 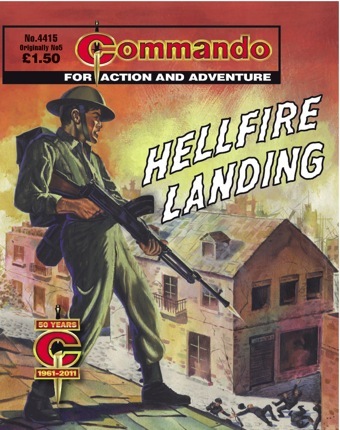 DC Thomson are now making every Commando cover available as an A1 poster — massive and very impressive. 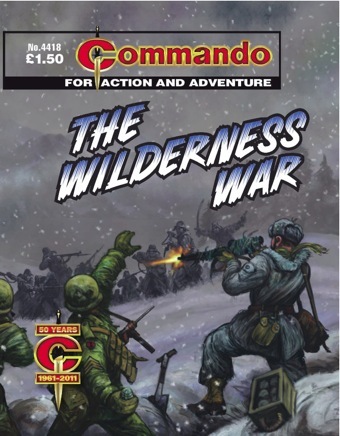 "The price is on the website at an introductory rate," notes Commando editor Calum Laird. "There are also several hundred from the back catalogue. More to be added when time allows. "Of the four books out this week, Dare Devil DFC has to have been titled by the bravest artist ever as the title is painted directly on to the artwork. "Can you imagine what would have happened if his brush had slipped?" Break-out! Street by street through a small coastal town in occupied France, No 5 Commando group were fighting desperately towards their target. Down a lane they were suddenly faced with a blank wall. They turned back, only to find Nazi storm-troopers had sealed the entrance with murderous machine-gun fire. But on this mission there could be no giving up. These battle-hardened, fierce young men just had to fight their way onward, for to them had been entrusted the well-nigh impossible task of seeking out Germany’s latest and most ghastly secret weapon. 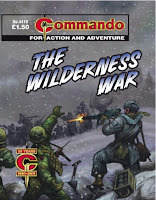 "This is an absolutely classic Commando tale, done to the rules we try to follow to this day," notes Calum Laird, in a special intorduction to this reprint issue. "Two heroes, one with nothing to prove, one with everything to prove. And the man with the work to do is doubted by almost everyone. "Throw in an almost suicidal special mission, tons of hot lead and high explosive and the recipe is complete. The dish is best served hot — as you can probably tell from Ken Barr’s cover art and Ortiz’s atmospheric black and white panels. "I think I’ll read it again…"
Meet Squadron-leader McMunn, DFC, who did with his Spitfire things no Spitfire was ever built to do. Fighter ace, hero, and, some said, a raving maniac! Not even his own pilots understood why McMunn courted death as he did. But they all knew that they’d follow wherever he led. Between these covers is the blazing saga of the Spitfire Squadron they called McMunn’s Irregulars — a law unto themselves. "When this story came out, I was too young to read it, but I remember reading it a few years afterwards at a mate’s house," says Calum. "I think it was his big brother’s. So until a few minutes ago I had only read it once. Yet it all seemed very familiar, so full of action and movement, just as I recalled it. "Ken Barr’s cover sets the tone for the tale wonderfully brought to life by Peter Ford’s artwork — his Spitfires look set to fly out of the pages of this story. 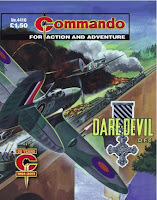 I can only say a big thank you to Commando’s first editor, Chick Checkley, for commissioning it." South America, 1935: The crew of Tin Goose Airlines — a small air-freight company — had hit hard times after an accident destroyed all but one of their aircraft. A battered Ford Trimotor 4AT was all they had left. They needed work fast, any kind of work, or they faced ruin. So when a seemingly straightforward contract came up they simply had to take it. They couldn’t know that the job could lead them to a far worse fate than bankruptcy! Sergeant Gene Malone was determined to protect his squad of GIs and had trained them hard in preparation for the combat they’d see in North Africa. Unexpectedly, however, their embarkation orders were for the Aleutians — a string of barren islands off the coast of Alaska. I’ve been in love with London’s Cartoon Museum since I saw an incredible exhibition of Heath Robinson’s implausible fantasy inventions there in 2007. Ever since then, whenever a friend or fellow comic creator visits from out-of-town I try my best to schedule in a visit to this fine gallery. I also make a point of catching every exhibition it hosts. There have been some fabulous ones and the latest is no exception. 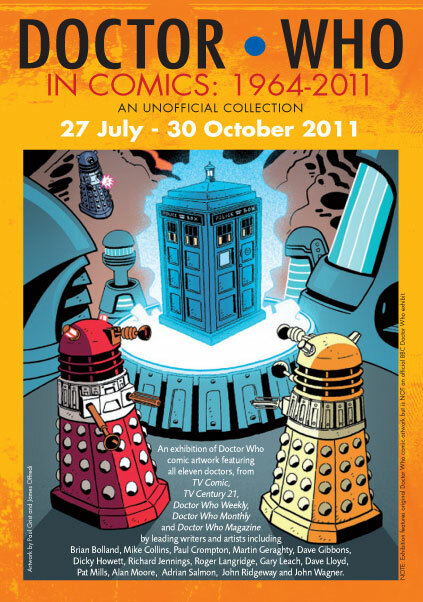 Running until the 30th October, Doctor Who in Comics features a collection of art drawn from every era of our favourite Time Lord’s comic adventures. 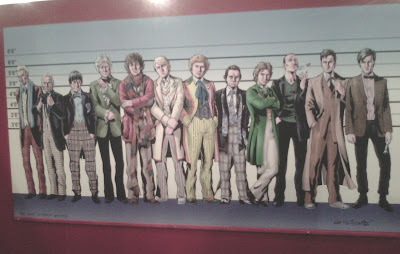 Visitors are first greeted by an almost life size Usual Suspects-style depiction of all 12 generations of The Doctor (including the non-canon Peter Cushing) by Lee Sullivan and a handy morphing incarnation guide on the telly by resident cartoonist Stephen Merchant. Following the suggested route (which was difficult on the opening night due to the sheer number of excited visitors) you’ll then be treated to pages from the 60s and 70s which originally appeared in TV Comic and TV Century 21, before graduating to material from Doctor Who Weekly/Monthly (which started in 1979) and then relative newcomers like Doctor Who Magazine (as it is now), Doctor Who Adventures and American publisher IDW’s Doctor Who title. Picking my favourites from among the many artists featured would be a nightmarish task, but I’d recommend ensuring that you’ve left enough time to marvel at the glorious constructions and linework of Frank Bellamy (probably most famous for his Eagle comic and Thunderbirds work). It’s the first time I’d seen a Bellamy original and it raised the hairs on the back of my neck. I also never tire of seeing the work of one of my favourite cartoonists, Paul Grist – who has a couple of pages from more recent Doctor Who adventures on display. I could almost repeat that last sentence wholesale, replacing Paul Grist with Roger Langridge – as I’m just as enamoured with his work. is bigger than your TARDIS game"
The great thing about The Cartoon Museum is the opportunity it provides to get up close and study the work of great comic artists in a way that just isn’t possible with a printed page. In my opinion, seeing Grist or Langridge’s work with blue pencils, whiteout and the odd fingerprint constitutes a comics masterclass all of its own. Other highlights include pages and illustrations from Adrian Salmon, Dave Gibbons, John Ridgway and David Lloyd (who has a page from a story written by his V For Vendetta collaborator Alan Moore, if I’m not mistaken). It was great to see so many comic creators in attendance at the opening. I noticed Oli Smith and Tony Lee (two writers currently embroiled with the good Doctor in comics, prose and radio) proudly spotting art from their own stories and many others were heard rattling off tales of their own brushes with Gallifreyan greatness. One of the reasons that Doctor Who is so well-loved, and translates so readily to almost any media, is that the character is a fantastic story engine, capable of inspiring and generating adventures, yarns and myths faster and more consistently than almost any other fictional property. This exhibition is a great testament to that. The Cartoon Museum is on Little Russell Street. Please visit their website for other info and details of special events related to this exhibition – including upcoming talks with Dave Gibbons, Pat Mills and Scott Gray. 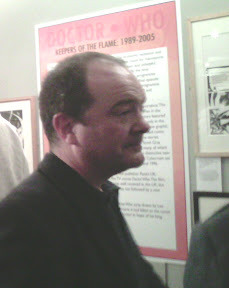 David Baillie is a writer and artist for comics and television. Working mainly from his East London back garden he has produced work for 2000AD, Judge Dredd Megazine and Teenage Mutant Ninja Turtles. He might have no hair but he does have a hammock in his aforementioned back garden. A quick reminder that the next print edition of media magazine Tripwire, which includes a preview of the STRIP Magazine story "Warpaint" by Phil Hester and John McCrea, is available to pre-order from your local comic shop using the Diamond code MAY 111336. 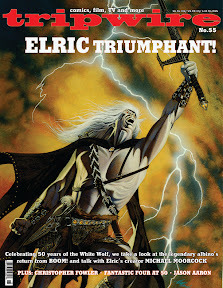 Tripwire #55 starts with an exclusive Elric cover painted by David Michael Beck, as the magazine celebrate 50 years of the White Wolf with his creator Michael Moorcock and a review BOOM!’s comic - plus, there's an interview with its writer Chris Roberson. Elsewhere, the magazine, edited by Joel Meadows, commemorates the Fantastic Four’s 50th birthday, and takes a long look at Green Lantern from the Golden Age all the way up to the movie and everything in between. Also included is an interview with comics creator Jason Aaron of Scalped and Punisher fame, and a chat with London-based author Christopher Fowler and a profileof movie location scouting company Sarah Eastel. Walt Simonson's eagerly awaited The Judas Coin hardcover, to be published this Christmas, gets a preview, including a unique sketchbook and pencils and inks section; and Shaenon Garrity writes about the history of webcomics seen from the inside. Rounding the issue out there are reviews of several of the Eisner-nominated graphic novels and 22 pages of comic strip content in the STRIPWIRE section. This includes the entire first episode of the creator-owned story "Warpaint" by Phil Hester and John McCrea, destined for STRIP Magazine, which centres on a teenage girl granted supernatural powers in defence of the planet. 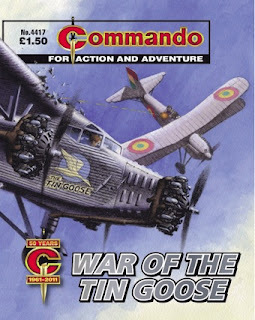 At £6.95 / $9.99 US for 124 pages in full colour, Tripwire #55 is, we think, great value for the money.